Aim: To determine self-perceived health status among yoga practitioners and their perceptions of yoga. Methods: This descriptive study was conducted in an online yoga platform during the month of December 2017. A total of 1602 individuals logged into the website during the data collection period, of which 158 volunteered to participate in the online survey. Data were collected using a questionnaire that included the participants’ descriptive characteristics (6 questions) and their perceptions of yoga (5 questions), and the Perceived Health Status Scale. Results: In the study, 92.4% of the yoga practitioners were females between the ages of 32 and 38; 36.1% had been practicing yoga for less than 6 months. Purposes for doing yoga were for sport (39.3%), spiritual development (24.0%), personal development (22.8%), and meditation (13.9%). The most popular place to practice yoga was a yoga studio (62.6%). Circumstances that prevented yoga practice were financial limitations (32.9%), lack of spare time (30.4%), fatigue (19.0%), and yoga not being a priority (17.7%). The large majority (96.2%) of respondents stated that yoga is necessary for a healthy life. Perceived physical health was “very good” for 57.0% of the individuals. Mean perceived health score was 1.47±0.32. Perceived health score was significantly associated with duration of yoga practice (F=1.53, p<0.05) and perception of yoga as essential for a healthy life (F=2.81, p<0.05). Conclusion: The majority of yoga practitioners in our study were well-educated females between 32 and 38 years of age. More than half of the respondents rated their physical health as “very good”. Longer yoga practice was associated with greater self-perception of good physical health. Amaç: Yoga yapan bireylerin sağlık durum algısı ve yogaya ilişkin görüşlerini belirlemektir. Yöntem: Tanımlayıcı araştırma, online bir yoga platformunda 01-30 Aralık 2017 tarihleri arasında yürütülmüştür. Evreni veri toplama sürecinde internet sitesine giriş yapan 1602 kişi oluşturmaktadır. Örneklem seçimine gidilmemiş evrenin tamamına ulaşmak hedeflenmiştir. Araştırmaya online anketi dolduran 158 gönüllü katılmıştır. Veriler, katılımcıların tanıtıcı özelliklerini (6 soru), yogaya ilişkin görüşlerini (5 soru) içeren soru formu ve Sağlık Durumunu Algılama Ölçeği kullanılarak toplanmıştır. Bulgular: Yoga yapan bireylerin %92.4 ü kadın ve 32-38 yaş aralığındadır. Bireylerin %36.1’i 6 aydan az süredir yoga yapmaktadır. Bireylerin yoga ile ilgili görüşleri incelendiğinde; yoganın birey için anlamı sırasıyla: spor (%39.3), ruhsal gelişim (%24.0), kişisel gelişim (%22.8), meditasyon (%13.9) olarak bildirilmiştir. Bireylerin en sık yoga yaptığı yer yoga stüdyosudur (%62.6). Yoga yapmayı aksatan durumlar; ekonomik sebepler (%32.9), zaman ayıramamak (%30.4), bedensel yorgunluk (%19.0), yoganın öncelik olmayışı (%17.7) olarak saptanmıştır. Bireylerin %96.2’si sağlıklı yaşam için yoganın gerekli olduğunu ifade etmiştir. Bireylerin %57.0’ı fiziksel sağlığını “çok iyi” olarak algıladığı saptanmıştır. Sağlığı algılama puan ortalaması 1.47±0.32’dir. Bireylerin yoga yapma süresi (F=1.53 p<0.05), yogayı sağlıklı yaşam için gerekli bulma (F=2.81 p<0.05) değişkenleri ile sağlığı algılama puan ortalaması arasında anlamlı bir fark bulunmuştur. Sonuç: Yoga yapan bireylerin büyük bir kısmının 32-38 yaş arası, yüksek eğitimli kadınlardan oluştuğu belirlenmiştir. Bireylerin yarısından fazlasının fiziksel sağlığını “çok iyi” olarak algıladığı belirlenmiştir. Yoga yapma süresi arttıkça bireylerin fiziksel sağlık algısının “çok iyi” yönde arttığı gösterilmiştir. Although yoga has only been practiced in the West since its import from India around the turn of the 20th century15, modern yoga has become a popular practice in the US and Europe. In 2002, 10.4 million adults in the US reported having done yoga at some time16, while this number increased to 31 million in 2016. 17 The popularity of yoga is also on the rise in Turkey. Considering the health benefits of yoga, the Turkish Sport for All Federation (SFA) has been actively promoting yoga as part of its mission to support healthy lifestyles and behaviors in Turkish society. SFA closely follows international developments in the field of yoga and promotes the practice in Turkey with the slogan “Yoga for all ages, yoga for life”.18 However, despite the popularity of yoga in Turkey, little is known about those who practice yoga. The aim of this study was to investigate self-reported perceptions of health status among yoga practitioners and to determine their perceptions of yoga. The study was conducted in an online yoga platform between the dates of December 1-30, 2017. The universe for this research consisted of 1602 individuals who logged into an online yoga platform website during the data collection period. There was no sampling and the goal was to reach the entire population. A total of 158 participants were recruited for the online survey. To use this online yoga platform, members pay a monthly subscription fee for access to expert videos about different yoga styles. This allows members to practice any style of yoga they want for as long as they want, anytime and anywhere. The questionnaire used in the study was prepared by the researchers based on similar previous studies.4,11,17 The questionnaire comprises three sections. The first section includes 6 questions eliciting personal information about the yoga practitioner such as age, gender, marital status, education level, economic status, and how long they have practiced yoga. The second section consists of 5 questions concerning subjective views about yoga, such as the individual’s reason for practicing yoga, obstacles to practicing yoga, motivation to practice yoga via telephone and computer, and the necessity of yoga for a healthy life. Descriptive statistics were expressed in numbers and percentages. Between-group comparisons were made using t-test and variance analyses. Statistical calculations were evaluated with 95% confidence intervals and a significance level of p<0.05. SPSS 22.0 (Statistical Program for the Social Sciences, IBM) software package was used for all statistical analyses. The scientific ethics committee of a university in the Aegean Region granted approval for data collection. Respondents voluntarily participated in the study by clicking a link to the survey after logging into the online yoga platform. At the beginning of the survey, respondents were informed about the purpose of the research and the confidentiality of the data. Although this study provided striking findings, there are some limitations. Yoga practitioners were defined in this study as individuals who had practiced yoga in the last month; however, it is not known how frequently they practiced yoga during that time. The inclusion criteria for this study included being at least 18 years of age. However, there is always the risk of recall bias and inaccurate self-reporting when gathering data via anonymous online surveys. Despite these limitations, the findings of this study provide valuable insight into the perceptions surrounding yoga and health. 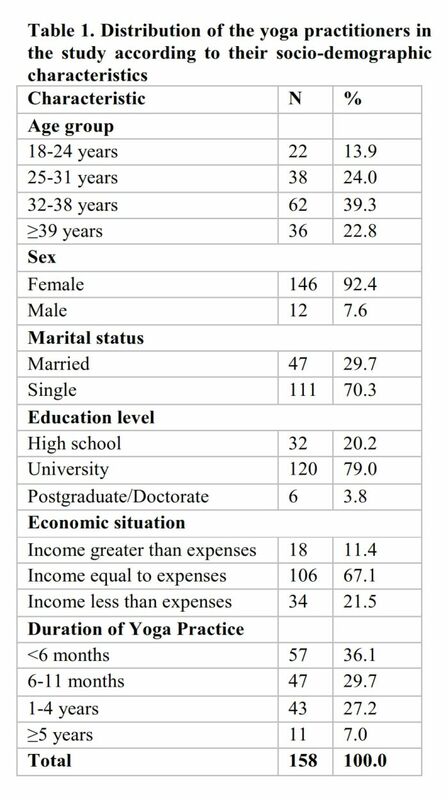 Of the yoga practitioners included in the study, 92.4% were females between the ages of 32 and 38; 70.3% were single, and 67.1% had income equal to their expenses. Seventy-nine percent of respondents were university graduates, 20.2% were high school educated, and 3.8% held postgraduate/doctorate degrees. 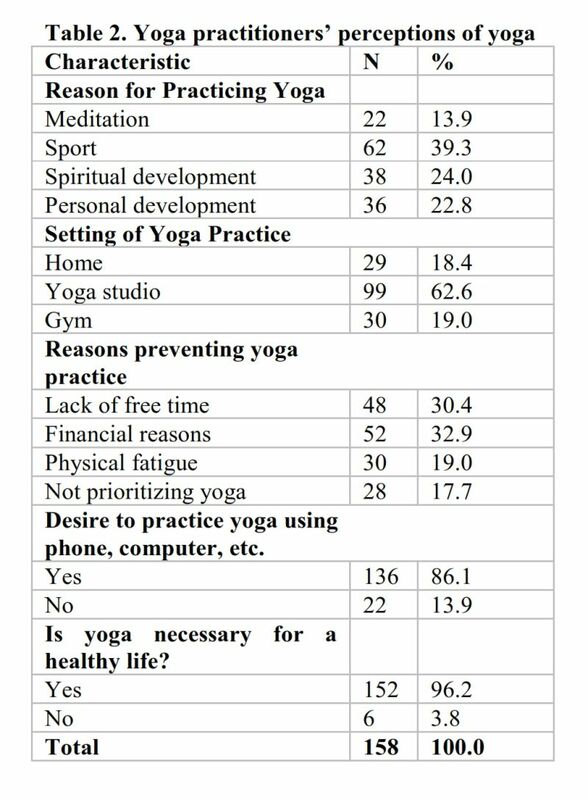 About 36% reported practicing yoga for less than 6 months (Table 1). Reasons for practicing yoga included for sport (39.3%), spiritual development (24.0%), personal development (22.8%), and meditation (13.9%). The most popular places for practicing yoga were the yoga studio (62.6%), gym (19.0%), and home (18.4%). Circumstances that prevented yoga practice were financial limitations (32.9%), lack of spare time (30.4%), fatigue (19.0%), and yoga not being a priority (17.7%). About 86% stated a desire to practice yoga by watching videos on a mobile phone or computer for the length of time and at the level of their choice, if possible. The large majority (96.2%) of the respondents stated that yoga is necessary for a healthy life (Table 2). Perceived physical health was “very good” for 57.0% of the individuals. Mean perceived health score was 1.47±0.32 (Table 3). Fifty-seven percent of respondents perceived their physical health as very good and the remaining 43% as good. The mean perceived health status score was 1.47±0.32. Mean perceived health scores were significantly higher among those practicing yoga for 6 months or longer (F=1.53 p<0.05) and those who considered yoga necessary for a healthy life (F=2.81 p<0.05) (Table 4). As yoga becomes increasingly common in Turkey both as an aspect of holistic health care and as a remedy for disease, it becomes necessary to investigate why and when people practice yoga and how their perceived health status relates to yoga. This information will be beneficial in planning yoga health interventions and making yoga more accessible. The present study was conducted to determine yoga practitioners’ perceptions of their health status and of yoga. Most of the research participants were female (92.4%) and between the ages of 32 and 38 years. Overall, the education level was high among the participants, most of whom were university graduates (79.0%). These findings are comparable to the literature.8,20 A study conducted in America in 2004 determined that the majority of yoga practitioners were young, well-educated females.8 Ross et al. (2013)20 also reported that yoga practitioners were mostly female (84.2%) and well-educated, with 90% holding an undergraduate or higher degree. However, a group of yoga practitioners aged 21-44 years in a study conducted in India by Telles et al. (2017)3 was predominantly male (67.3%) with high school education (62.5%). Similarly, 62.6% of the respondents in our study stated that they practiced in yoga studios. Ross et al. (2013)8 also reported that more yoga contact time (overall duration and/or frequency of practice) was associated with higher likelihood of belief in the health benefits of yoga. Despite its more esoteric spiritual origins, modern yoga is now considered a conventional form of exercise. 21 In the current study, the most common reason for practicing yoga was for the purpose of sport/exercise, followed by spiritual development, personal development, and meditation. Our finding that physical fitness was the main motivator of yoga practice is consistent with results reported from Australia22, America7,17, and even India3. In another study, both yoga practitioners and instructors cited exercise and stress relief as their primary reasons for doing yoga. Secondary motives included getting into shape, improving flexibility, and alleviating depression and anxiety.23 On the other hand, the yoga practitioners in a study by Ross et al. (2013)8 stated that they did yoga because it made them happier (86.5%), increased their energy levels (84.5%), and improved the quality of their sleep (68.5%) and social relationships (67%). In a study by Park et al. (2016) 23, participants practiced yoga for various reasons. The most common of these were to improve flexibility (96.7%), for relaxation (94.5%), and to promote feelings of peace (81.3%) and happiness (68.1%).23 Other reasons included relieving depression/anxiety or pain, controlling side effects, weight control, and spirituality. 23 Moreover, healthy adults prefer yoga for reducing their stress and maintaining general well-being.9 In a study24 conducted among participants of a yoga class in the United States (US) (n=290), reasons cited for beginning or returning to yoga also varied widely, with the most common being general wellness (81%), physical exercise (80%), and stress management (73%). Less common reasons given included seeking a spiritual experience (37%), alleviating a health condition (28%), or preventing illness (23%).24 These findings indicate that yoga is an accessible health practice that can benefit many people for many different reasons and that practitioners approach yoga with preconceived goals and expectations. Approximately all (96.2%) of the yoga practitioners in our study expressed a belief that yoga is essential for a healthy life. Similarly, 89.5% of the participants in a study by Ross et al. (2013) believed that yoga practice had a positive impact on their general health.8 In a 2008 study by Birdee et al. (2008), 58% of the yoga practitioners stated that yoga was an important factor in their physical health, while 16% used yoga to treat specific medical conditions. 7 The Press Trust of India reported in 2016 that people were becoming more aware that certain diseases could be managed through yoga and other healthy lifestyle behaviors.25 Overall, the evidence suggests that yoga is primarily seen and used as a way to maintain health. The results of our study confirm previous reports that people improve their health and feel better by practicing yoga. Furthermore, our study demonstrated that the longer yoga is practiced, the more likely the practitioner is to perceive their physical health as very good. The perceived health scores of people who practiced yoga for more than 5 years were significantly higher than those practicing for less than 6 months. In addition, perceived health scores were higher among people who considered yoga essential for a healthy life compared to those who did not. It is an expected finding that an individuals’ level of yoga participation would be correlated with how strongly they believe in its health benefits. It is clear that yoga practitioners believe that yoga improves their health, regardless of how long and where they practice. However, it has yet to be determined whether this belief precedes and promotes their yoga practice, or arises as a result of experiencing and benefiting from it. Further research elucidating this relationship could also be informative in the planning of yoga interventions. Yoga is an ancient mind-body discipline that has evolved from an esoteric pursuit of spiritual goals to a mainstream practice that enhances psychological and physical health and well-being. The majority of yoga practitioners in the present study were highly-educated females aged 32 to 38 years. The most common reason cited for practicing yoga was for the purpose of sport/exercise. A yoga studio was the most preferred setting for practicing yoga. More than half of the yoga practitioners perceived their physical health as very good and the rest perceived it as good. Longer yoga practice was associated with a higher likelihood of very good self-perception of physical health. National surveys can be employed next to further characterize yoga practitioners in Turkey. Furthermore, future studies should determine which subpopulations may benefit the most from practicing yoga and which types of yoga are most beneficial. The author is grateful to yoga practitioners who participated in the study. Broad, W.J. The Science of Yoga. New York: Simon & Schuster; 2012:1. Nagarathna, R., Nagendra, H. Integrated Approach of Yoga Therapy for Positive Health. Bangalore: Swami Vivekananda Yoga; 2008:7-8. Telles, S., Sharma, S.K., Singh, N., & Balkrishna, A. characteristics of Yoga Practitioners, Motivators, and Yoga Techniques of choice: a cross-sectional study. Frontiers in public health, 2017; 5, 184. Ding, D., & Stamatakis, E. Yoga practice in England 1997-2008: prevalence, temporal trends, and correlates of participation. BMC Research Notes, 2014; 7(1): 172. Brooks, D.R. Encountering the Hindu Other: Tantrism and the Brahmans of South India. Journal of the American Academy of Religion, 1992; 60(3), 405-436. Field, T. Yoga clinical research review. Complement Ther Clin Pract, 2011;17(1):1-8. Ross, A., Freidmann, E., Bevans, M., Thomas, S. National survey of yoga practitioners: mental and physical health benefits. Complement Ther Med, 2013; 21: 313e323. Chong, C.S., Tsunaka, M., Tsang, H.W., Chan, E.P., Cheung, W.M. Effects of yoga on stress management in healthy adults: a systematic review. Altern Ther Health Med, 2011;17(1):32–38. Gard, T., Brach, N., Hölzel, B. K., Noggle, J. J., Conboy, L. A., & Lazar, S. W. Effects of a yoga-based intervention for young adults on quality of life and perceived stress: the potential mediating roles of mindfulness and self-compassion. The Journal of Positive Psychology, 2012; 7(3): 165-175. Park, C. L., Riley, K. E., & Braun, T. D. Practitioners' perceptions of yoga's positive and negative effects: Results of a National United States survey. Journal of bodywork and movement therapies, 2016; 20(2): 270-279. Raghuwanshi, A. A review: history of revival of yoga in 20th century and establishment of yoga as a science in the 21st century. Sense Inter Sci Yoga, 2011; 1, 208e216. Baysal, D., & Güzel, P. MEB, Okul Pansiyonlarında Kalan Kız Öğrencilerde Yoga Etkinliğinin Ders Dışı Eğitim Çalışmaları Kapsamında Uygulanabilirliğinin İncelenmesi. Sakarya University Journal of Education, 2017; 7(1): 91-108. Atılgan, E., Tarakcı, D., Polat, B., & Algun, Z. C. Sağlıklı kadınlarda Yoga temelli egzersizlerin esneklik, yaşam kalitesi, fiziksel aktivite ve depresyon üzerine etkilerinin araştırılması. Journal of Exercise Therapy and Rehabilitation, 2015; 2(2): 41-46. Brems, C., Colgan, D., Freeman, H., Freitas, J., Justice, L., Shean, M., & Sulenes, K. Elements of yogic practice: Perceptions of students in healthcare programs. International journal of yoga, 2016; 9(2):121. Barnes PM, Powell-Griner E, McFann K, Nahin RL. Complementary and alternative medicine use among adults: United States, 2002. Adv Data, 2004; 343:1–19. http://dx.doi.org/10.1016/j.sigm.2004.07.003. The Turkish Sport for All Federation-SFA, Offical web page 2018 (Türkiye Herkes İçin Spor Federasyonu in Turkish), 2018. http://www.his.gov.tr/herkes-icin-spor.html. Date accessed: 25.02.2018. Esin M.N. Endüstriyel alanda çalışan işçilerin sağlık davranışlarının saptanması ve geliştirilmesi. Hemşirelik Programı Doktora Tezi. İstanbul Üniversitesi Sağlık Bilimleri Enstitüsü. 1999:54. Saper R.B., Eisenberg D.M., Davis R.B. Prevalence and patterns of adult yoga use in the United States: results of a national survey. Alt Ther Health Med, 2004;10:44–9. Corliss R. The power of yoga. Time, 2001;157:54–63. Park, C. L., Riley, K. E., Bedesin, E., & Stewart, V. M. Why practice yoga? Practitioners’ motivations for adopting and maintaining yoga practice. Journal of health psychology, 2016; 21(6), 887-896. Quilty M.T., Saper R.B., Goldstein R. Yoga in the real world: Perceptions, motivators, barriers, and patterns of use. Global Advances in Health and Medicine, 2013; 2: 44–49. Press Trust of India. Yoga Can Help Control Non-Communicable Diseases, 2016. http://www.financialexpress.com/india-news/yoga-can-help-control-non-communicable-diseases-j-p-nadda/293816/. Date accessed: 25.02.2018.